• Children ages 6 weeks through 24 months old. • Full-time care only (30 – 50 hours per week). • Special Needs care is determined by the Special Needs Evaluation Review Team (SNERT). • Single/Dual Active Duty Military living or working aboard Camp Pendleton. 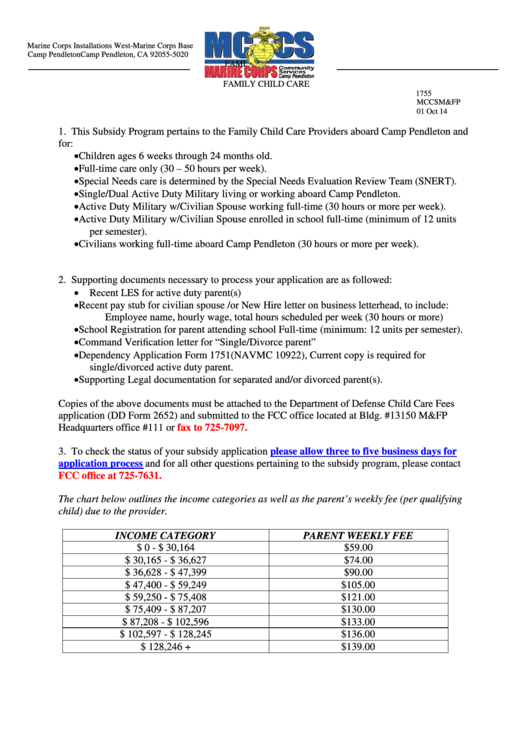 • Active Duty Military w/Civilian Spouse working full-time (30 hours or more per week). • Civilians working full-time aboard Camp Pendleton (30 hours or more per week). • School Registration for parent attending school Full-time (minimum: 12 units per semester). • Supporting Legal documentation for separated and/or divorced parent(s). child) due to the provider.